Dome C on the Antarctic Plateau is an ideal place to conduct astronomical observations. 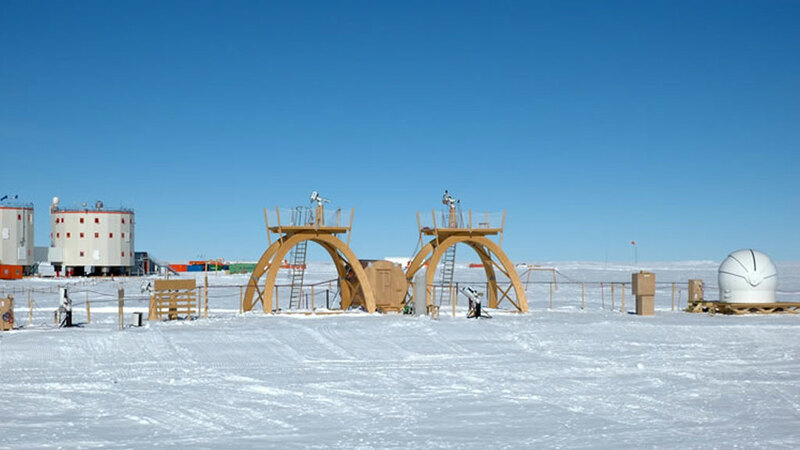 The ARENA (Antarctic Research, a European Network for Astrophysics) consortium of 22 European and Australian partners including polar institutes, research laboratories and industrial companies has been investigating research possibilities, installing instruments, and planning to construct an observatory at Dome C’s Franco-Italian Concordia Station since 2006, when the four-year project began. In this interview, Dr. Nicolas Epchtein from the Hippolyte Fizeau Laboratory of the CNRS at the University of Nice discusses the past, present and future of astronomy at Dome C.
How long has Concordia Station been operating? Concordia Station was built by the French and Italian Polar Agencies: l’Institut Paul Émile Victor (IPEV) in France and la Programma Nazionale Ricerche in Antartide (PNRA) in Italy. It’s a 50/50 joint venture. Together they built the two cylindrical towers of the station, which was designed to have everything needed to function year-round. The station has been open for overwintering since 2005, with a staff of about 15 persons every winter season (February to November). Concordia is a multidisciplinary and multinational station, and astronomy isn’t the only discipline being studied there. Atmospheric physics, meteorology, glaciology and geomagnetism experiments are being conducted, there's a project to collect micrometeorites. The European Space Agency (ESA) is also planning to conduct physiology experiments to see how the human body would react to long periods of isolation and living in harsh conditions in preparation for eventual long-distance flights to Mars. How did the ARENA network come about? Five years ago we decided to try to put together the expertise of different laboratories in Europe and propose the ARENA networking action. It was a coordination action under the EU Commission’s Sixth Framework Program (FP6), which gathered 22 partners from seven countries in Europe plus Australia. Italy and France have been investigating the site’s potential for astronomy for about a decade together with Australia, which is particularly interested in Antarctica for obvious reasons; it’s the closest ideal observing site to their country. The Earth’s atmosphere is extremely opaque to infrared radiation, except in certain spectral windows. The main source of opacity is coming from water vapour molecules, and since the humidity of the atmosphere (more precisely the column density of water vapour content) in Antarctica is much lower than in any other sites for astronomical observation on the planet, it greatly improves infrared and submillimetre-wave transparency. Moreover, the turbulence properties of the atmosphere are unique and allow improved image quality. So one of the most important things one can do for ground-based astronomy is take advantage of the unique characteristics of the atmosphere above Dome C.
How does ARENA fit into the context of astronomical observations in Antarctica? In the 1970s and 80s, American astronomers from different universities in the US (Boston University and the University of Chicago in particular) carried out a project to install a suite of instruments for radioastronomy and an optical infrared telescope, and established Center for Astrophysical Research in Antarctica (CARA) which was the starting point of radio astronomy developments at the American Amundsen-Scott station at the South Pole. Following up on this, there have been other places where astronomy has been developed under the management of Russian, Japanese, French, Italian and now Chinese teams. Back in the early 1980s the French collaborated with the Americans at Amundsen-Scott Station to conduct solar experiments. Since the South Pole experiences perpetual sunlight over several months, it’s possible to observe the sun over long uninterrupted periods of time. A French team led by Eric Fossat from the University of Nice conducted the first observation of the sun over a period of several days in the early 80s. This was the beginning of the discipline of helioseismology, the study of wave oscillations in the Sun’s interior, which helps astrophysicists better understanding the internal structure of the Sun. At this time there were also some observations in the infrared part of the spectrum using a 60 cm telescope called SPIREX (South Pole Infrared Explorer), which was jointly operated by Americans and Australians during the 1990s, and which provided the deepest images from space ever recorded from the ground at wavelengths of 3.6 microns (µm), in the mid-infrared part of the electromagnetic spectrum. Other instruments such as BICEP, which cover the millimetre wavelengths of the electromagnetic spectrum (microwaves), were installed especially for observing the cosmic microwave background (CMB), the “fossil residue” of the radiation produced by the Big Bang. Recording tiny fluctuations in this radiation is possible because the atmosphere at Amundsen-Scott Station is extraordinarily stable. And what about Dome C? How was it decided that this should be used as the new place to develop for astronomy? The French and Italians built the Concordia Station at Dome C not for astronomy originally but for drilling the 3 km deep ice cores under the European Project for Ice Coring in Antarctica (EPICA), which extracted an ice core that went back some 800,000 years, providing a history of the climate changes that have occurred since then. However it happens that Dome C is also an ideal place for astronomy –even better than the South Pole. Dome C sits at an altitude of more than 3,000 metres, making it quite higher than Amundsen-Scott Station. The winds at Dome C are also a lot calmer. In Antarctica, katabatic winds flow at a very low altitude from the domes, creating a thin layer of turbulence. In other astronomical observatories elsewhere in the world like the ones in the Chilean Andes and Mauna Kea Observatory in Hawaii, the turbulent layer of the atmosphere is quite thick - about 100 metres or more. This surface layer of turbulence strongly blurs the images, especially in the visible and near infrared parts of the spectrum. On the contrary, in Antarctica this turbulent layer is not very thick. It depends on the altitude and location from which you’re making observations. Due to its particular location and altitude, Amundsen-Scott Station has a rather thick layer of turbulence, strong winds and few days of clear weather, so it is not the best place in Antarctica to make observations in the visible and infrared parts of the spectrum. However Concordia Station, which sits atop Dome C, is in a better location to make such observations, as the turbulent layer is only about 30 metres thick - and often even thinner. This means we would only need to build a tower a few tens of metres high to get above the turbulent layer and excellent conditions for making observations. Special techniques of adaptive optics called Ground Layer Adaptive Optics (GLAO) may also alleviate the effect of turbulence on the images. So at Dome C, many types of critical observations can be performed in very good conditions thanks to the three critical advantages: excellent transparency, low thermal background radiation in the infrared part of the spectrum and very good conditions for making observations. But it won’t be possible to fund all of the astronomical projects proposed in the next 10 years, but my personal feeling is that the first thing to do is to install a significant wide field infrared telescope (called PLT for Large Polar Telescope) to complement space missions already in preparation such as the James Webb Space Telescope (JWST) and the ground based European Extremely Large Telescope (E-ELT), which will be both more sensitive to faint objects, but will not be able to provide the coverage of large sky areas like a wide field telescope could. Do you think this will be the next project undertaken? That’s my personal feeling. Right now we’re putting together a proposal to get financing for this project. I don’t know if it will be funded, but I’m doing my best to push this project over the next 10 years. This doesn’t mean that the other projects won’t move forward. But my conviction is that this wide field infrared telescope has the highest priority and is the most easily manageable taking into account the present level of logistical resources. What about plans to install a number of telescopes at Dome C? Over the longer term, there are plans to install an optical/infrared interferometeric array. There is, for instance, a proposal called ALADDIN (Antarctic L-band Astrophysics Discovery Demonstrator for Interferometric Nulling) within the framework of the DARWIN project, a mission that ESA proposed years ago to fly an interferometer into space to detect and characterize exo-earths. The role of ALADDIN would be basically to select targets for a future interferometric space mission, which would not be hampered by the presence of the so-called exozodis (the equivalent of the zodiacal light produced by the diffusion of solar light by tiny interplanetary dust). 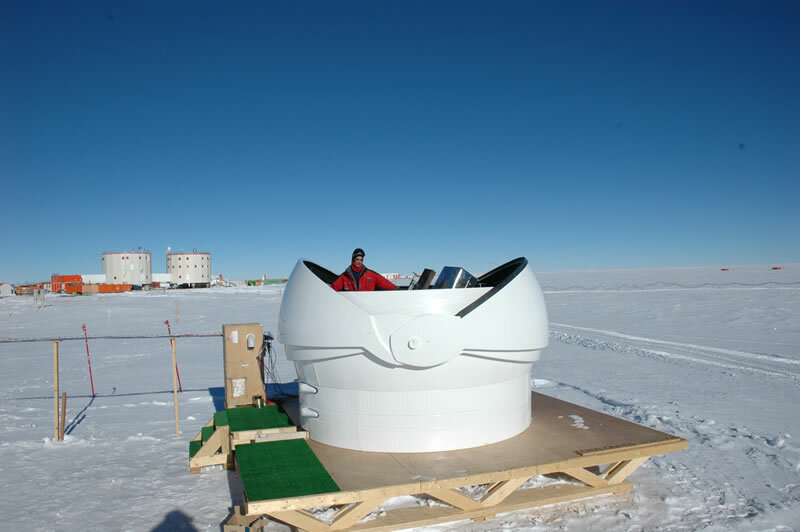 Since Antarctica provides great visibility at a much lower cost, one proposition in the project is to build at Dome C a circular rotating structure holding two one-metre telescopes at about 30 metres above the ice, which could do the job while at the same time be the basic configuration for a pathfinder interferometer. It would be a medium-sized instrument; something that would save time and money on a future space mission and assess the potential to use interferometry in Antarctica, acting as a precursor to much larger arrays composed of tens of mirrors spread over a square kilometre, similar to the KEOPS project, for example. What observations are currently going on at Dome C? The site-testing experiments are currently collecting data until they get a statistically significant data set. This past year we set up one instrument to do astronomical observations: the ASTEP 40 cm telescope, which will observe planetary transits. Later in 2010-11, a 80 cm telescope for infrared observations managed by the Italians will start operations. But at the moment COCHISE (Cosmological Observations at Concordia with High-sensitivity Instruments for Source Extraction), an Italian 2.6-metre millimetric telescope mainly devoted to cosmological observations, is evaluating sky conditions to determine what kind of observations can be made in this promising spectral range. It is also important to mention that Concordia Station is extremely well-suited to carry out high angular resolution observations of the Sun. Solar instruments are proposed to take advantage of the excellent observing and "coronal" conditions (very low diffusion of the solar light by aerosols in the atmosphere) in particular to study the chromosphere and the corona. Last but not least, there is also an instrument currently being prepared called QUBIC (Q&U Bolometric Interferometer for Cosmology), an interferometer equipped by arrays of bolometers (devices used for measuring the energy of incident electromagnetic radiation). This device will investigate the B-mode polarization of the CMB and provide extremely important clues to the origin of the universe and the Big Bang. This is a very efficient collaboration between France, Italy, the UK and the US. So this means a number of the scientific activities currently going on at Concordia are simply determining feasibility for future observations? Yes. Before investing a lot of money building larger instruments, one must be absolutely sure expected scientific breakthroughs will be achievable. We are just moving from a long assessment phase to a more exciting step of scientific observation. What we have to do now is maintain the momentum these networking actions have created, proceed with monitoring the atmospheric parameters, start astronomical observations with the recently commissioned small instruments and set up industrial-phase studies for at least one of the larger instruments. Until now, single countries have been able to manage funding for small instruments. However if you want to build an instrument that costs, say, 50 million euros or more, you need a robust international collaboration and a strong and appropriately-managed consortium that makes use of the different skills and expertise from different laboratories in various countries. The European Southern Observatory (ESO) has been involved in the ARENA network, although not strongly because they have other priorities, such as the ALMA millimetric interferometer and the E-ELT, both in the Chilean Andes. However they keep an eye on what’s going on in Antarctica. If there’s a possibility to construct a very large telescope or even a kilometric interferometer in Antarctica they would certainly be interested in contributing in some way. But this is clearly for the distant future. Would you be open to welcoming partners outside of the 22 countries currently involved in ARENA? We are definitely open to any collaboration that would bring new expertise or added value to our projects. The Chinese are very active in developing Kunlun Sation at Dome A, which is somewhat higher than Dome C at 4,000 metres. There may be slightly better atmospheric conditions there. The Chinese are strongly engaged in fostering development of astronomy at Dome A in collaboration with the Australians and the Americans. It would be wise if we could broaden the European collaboration for astronomy in Antarctica to a worldwide collaboration sharing station access, logistical means and facilities so we can conduct the best possible research at each site. Will there eventually be a sort of coordinated network for astronomical observations across the Antarctic Plateau? Yes, this would certainly be great, but there are plenty of political considerations, as you can imagine. This is not just in the hands of us scientists, but also in the hands of the governments and polar agencies of each country, which may have differing objectives or policies. But it would certainly be a great step forward to set up coordinated management for the development of astronomical research infrastructures on the Antarctic Plateau. The cooperative experiences we’ve had through ESO would be very useful in this respect. In fact, SCAR (the Scientific Committee on Antarctic Research) has just created a group on astronomy in charge of coordinating international astronomical activities in Antarctica. We expect a lot of support from SCAR. Of course, we also expect to have support from the European Commission, because it has an important role to play in maintaining and improving the coordination of European scientific activity in Antarctica, in particular in the fields of astronomy and astrophysics. Nicholas Epchtein is Research Director at the Hippolyte Fizeau Laboratory of the CNRS at the University of Nice. Part of Europe's astronomical resarch in Antarctica at Dome C, his research interests include lage-scale astronomical infrared surveys as well as infrared detection and instrumentation in Antarctica.